Browse: Home / What mysteries lie in the ruins of the Scientific Studies and Research Centre in Damascus? Don’t think that the lion is smiling at you. I was reminded of this lion while clambering through the ruins on the side of the Scientific Studies and Research Centre in the Damascus suburb of Barzeh last week. 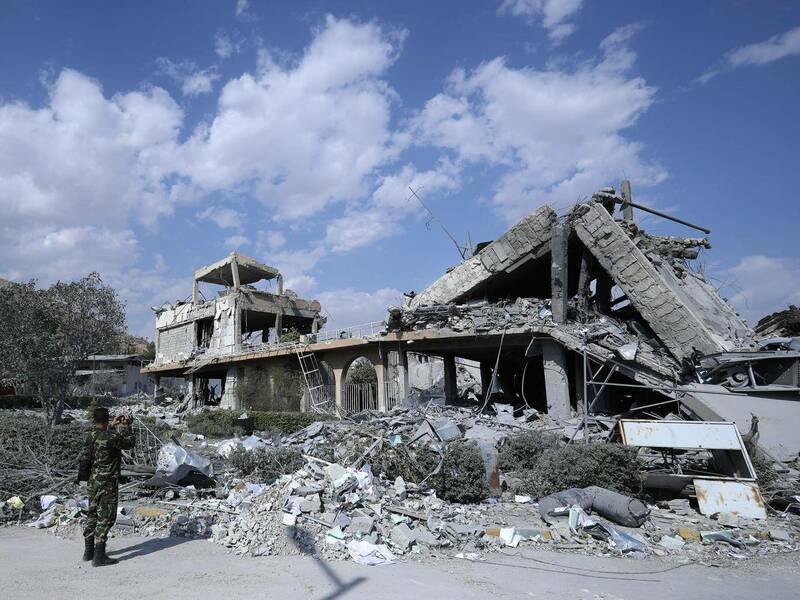 This was the centre – now famous from so many satellite pictures – destroyed by Donald Trump’s missiles when they struck at “the heart of Syria’s chemical weapons programme”. Did they? Anything with a Strangelove name like the “Department of Pharmaceutical and Civilian Chemical Research” – the bit of the complex hit by at least 13 missiles – deserves to have its contents studied closely. I’d been refused permission to visit this Syrian institution for three days. If it was all in ruins – which it assuredly is, and on a scale much larger than the photographs suggest – why the delay? And does it matter? Well, yes. I am reminded of the much more famous Iraqi “baby milk factory” bombed by the Americans in 1991 which General Colin Powell called “a biological weapons factory, of that we are sure”. My colleague Patrick Cockburn wrote of this last week, recalling his visit to the factory only hours after the bombing. After the war, it turned out that the building probably had been an infant formula factory after all – although what can’t you do with a glass of milk? The problem is that while we believe all Arab dictators regularly lie, we Western folk are supposed to hold our own leaders to account – and ensure that they tell the truth when they claim to act on our behalf. That’s why the Douma attack must be fully explained, and that’s why I wanted to know if this wreckage in Barzeh (the direct response to Douma, although of course no one was killed in Barzeh) was what we said it was, or whether it was what the Syrians claimed it to be – a medical research facility. Was the lion smiling at me? Or was I misinterpreting the meaning of its face? Certainly, Dr Said al-Said, head of the centre’s polymers department, was all smiles, and for what it’s worth, he doesn’t look like Dr Strangelove. And the rubble of his bombed research centre when I met him, without “minders” or guards, yielded to me little proof of the chemical warfare research centre its American destroyers claimed it to be. It looked, indeed, very much like a site where, according to the 192-nation Organisation for the Prohibition of Chemical Weapons, during its most recent visit last November, there was no evidence of chemical or biological weapons being developed, tested or produced. The OPCW is the same institute currently investigating the presumed gas attack on Douma. “If this was a chemical weapons centre,” he says, jabbing me in the chest with his finger, “You’d be dead just standing here today.” Hardly conclusive given the time that had elapsed, and of course it may have been used merely for research, rather than storage of chemical weapons, which formed one part of the Americans’ claim. Same old question. What can’t you do with a glass of milk? I scrambled through the ruins on my own for more than an hour and found five buildings in this research campus utterly blown apart. I was free to roam around in the sun, much to 64-year old Al-Said’s amusement. But it had been four days since the American-Anglo-French air strikes. Western politicians routinely accuse their enemies of hoovering up incriminating evidence before opening bomb sites to any journalists. And I’d been kept waiting for three days. Yet when I eventually drove through the gates of the campus, documents and files were still wedged into the flattened concrete and flapping in the breeze. The most intriguing papers I could find related to a desalination project in rural Syria and a published dissertation in English by Kuwaiti scientists on the use of rubber in sealing concrete road bridges. While I was there, mechanical diggers began to haul away vast hunks of masonry – some with yet more papers trapped in the wreckage – and dumping them in commercial lorries for disposal. Could this really have been the site of an elaborate cover-up? Could the Syrians remove the evidence in four days? And while I’m no chemical weapons expert, the OPCW definitely is and visited Barzeh several times in 2013. But what happened since then? “They said it was free of any chemical warfare research,” Al-Said said. The published reports confirm this but no visit has taken place since last November. Yet – questions multiply here, rather like they probably do in a research centre – is it conceivable that the OPCW would not have made some reference to a change in the Barzeh complex’s purpose if they suspected this in the past five months? There was still a strong smell of burning plastic which he attributed to the smouldering remains of computers and plastic desks in the ruins. I walked deep inside the wreckage and neither the workmen nor the centre’s portly boss grew nervous or asked me to stop – usually a tell-tale sign that someone is getting nervous. It happened to me in Serbia when I discovered military slit-trenches behind a Nato-bombed hospital – the civilian patients, it turned out, were dead, the Yugoslav soldiers hiding there against all the laws of war were unharmed and long departed. Among the undamaged buildings on the Syrian campus were student lecture rooms and a children’s school with paintings of animals which had clearly – given the fading paint – been decorated on the walls many summers ago. His students and lecturers, he insisted, were researching the production of medicinal chemicals and especially the DNA of scorpions and snakes, and leukemias and cancers. “We have been producing the research for medicines for local use but which are sold all over the Middle East. We were developing rubber particles [sic] for the oil industry and researching the use of rubber for bridge construction.” When Al-Said told me this, he was unaware that I had already found papers on the subject amid the rubble – a point in his favour. “The OPCW had given us certificates twice,” he added. I also noted that this large campus lay less than a mile from the scene of fierce battles 18 months ago between the government army and Nusrah (as well as some ‘Free Syrian Army’ rebels). I witnessed some of this fighting at the time. Would the Syrian regime have maintained a chemical weapons research centre which could so easily have fallen into the hands of its enemies – then or later? If the Americans were correct when they said at the weekend that the Barzeh centre is used for the research, development, production and testing of chemical and biological weaponry, then the regime was certainly taking some grave risks – before or after – the battles. For the American claims to be correct, then, an awful lot of work must have gone on to change the nature of this complex in the past five months – since the OPCW inspectors were last there. The infamous Baghdad baby milk factory is now generally accepted to have been genuine – although the Iraqi regime put a fake sign in English on the wrecked gates for television cameras after the bombing. The only sign beside the wrecked Syrian complex is a large portrait of Bashar al-Assad with the legend “All for you” written upon it. In Arabic. But back to the lion. Poor old Muttanabi was eventually killed by a man whom he had insulted in a poem. His name – wait for it – was Dabbah al-Assadi. No relation, of course.